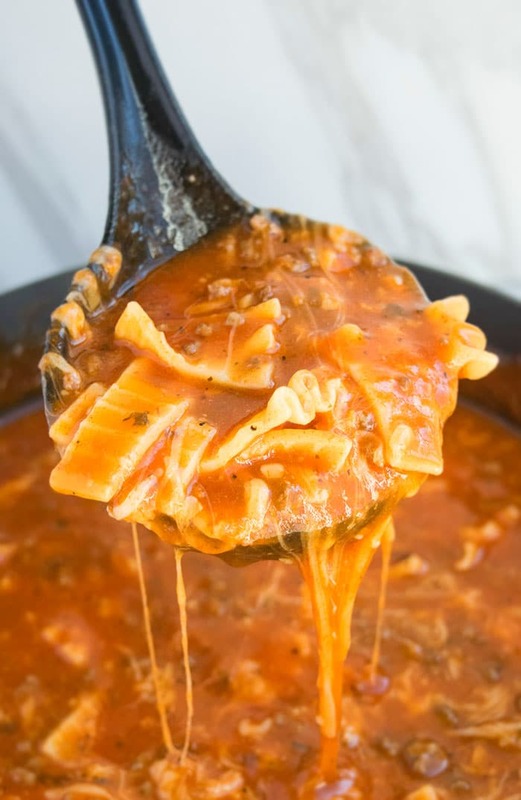 Quick and easy one pot lasagna soup recipe made with simple ingredients on stovetop. This 30 minute meal is loaded with noodles, tomatoes, ground beef and cheese. 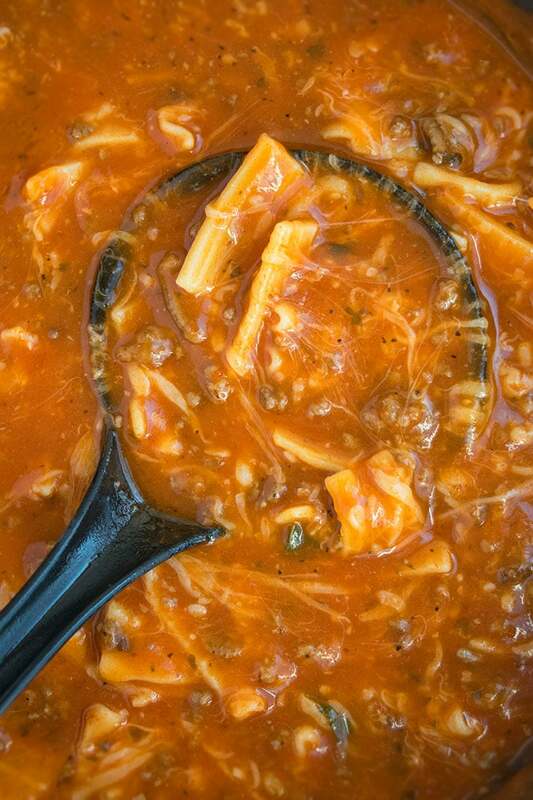 One pot meals and recipes like this quick lasagna soup are what makes dinner time manageable for me. My family loves this soup. It has all the flavors of a classic lasagna with half the mess, half the time and just as good flavor, if not better. I bet you already have these lasagna soup ingredients! The ingredient list might look long but they are items that you probably already use in your daily cooking. Healthy Lasagna Soup– Replace beef with frozen vegetables of your choice. Use vegetable broth and low fat cheese. 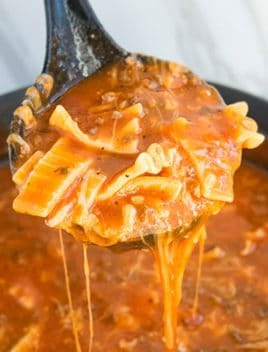 Cheesy Lasagna Soup– Add more mozzarella and parmesan cheese along with ricotta cheese to make a really creamy soup. Chicken Lasagna Soup– Replace beef with 1-2 cups shredded rotisserie chicken. 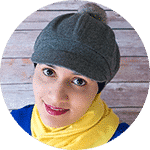 Vegetarian Lasagna Soup/ Vegan Lasagna Soup– Use vegetable broth, vegan cheese, vegetarian beef crumbles and 1/2 cup frozen vegetables. Don’t use this recipe to make slow Cooker Lasagna Soup/ Crockpot Lasagna Soup or Instant Pot Lasagna Soup. That’s because less liquid needs to be used for those versions. Cook the ground beef with Italian seasoning and garlic and drain fat. Add pasta sauce, broth, all the seasonings, noodles. Cook until pasta is fully cooked and stir in heavy cream. Turn off heat and sprinkle fresh basil, shredded cheese on top and you are done. 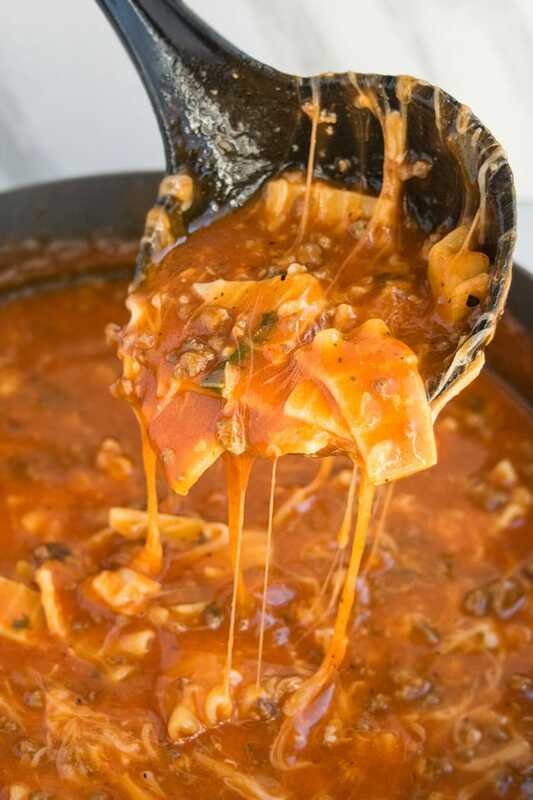 How to thicken lasagna soup? 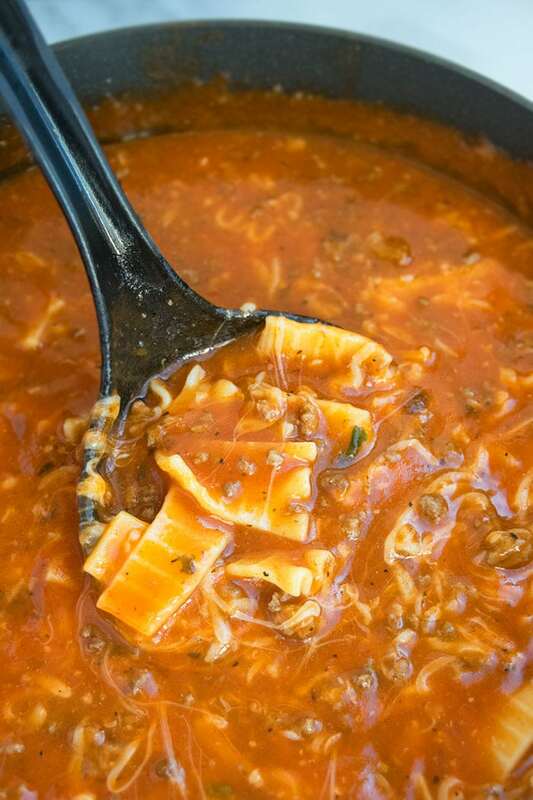 How to make lasagna soup with leftover lasagna? Mix leftover lasagna with 1 jar pasta sauce, 1 can crushed tomatoes, 1/3 cup heavy cream, 2-3 cups broth, Italian seasoning. Mix and bring everything to a boil. Garnish with fresh basil and shredded cheese and serve immediately. -More or less broth can be added, based on the soup consistency you like. -More heavy cream can be added to make the soup even more creamy. -Use low sodium broth to prevent the soup from becoming too salty. -Vegetable broth can be used instead of chicken broth. -Instead of heavy cream, 1/2 cup- 1 cup cream cheese can be mixed into the soup at the very end. -Instead of lasagna noodles, 2-3 cups of small shells or small elbow pasta can be used too. 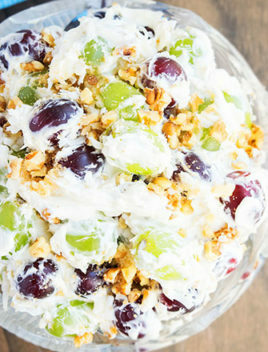 -Recipe can easily be doubled to serve a bigger crowd. Heat oil in nonstick pot over medium high heat. Add ground beef, onions, garlic, Italian seasoning and cook until until beef is brown. Add pasta sauce, broth, crushed tomatoes, vinegar, sugar, salt, pepper, oregano, parley, rosemary, bay leaf, lasagna noodles, half the basil. Reduce the heat to medium-low and let it simmer until noodles are fully cooked. Stir often to prevent the soup from burning and sticking to the pot. Stir in heavy cream and the remaining basil. Turn off heat and sprinkle shredded mozzarella and parmesan cheese and the cheese will start to melt immediately. Serve and enjoy! I love being able to get all the flavors of lasagna without having to put in all the work….genius! Sounds like a hearty fall dinner! This is amazing. 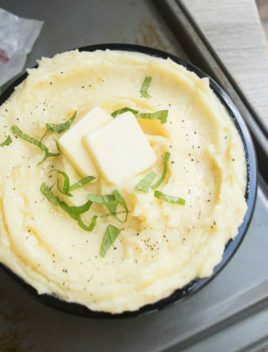 We love how easy and flavorful this is!! Can’t wait to try. Oooh, great variations on this too. 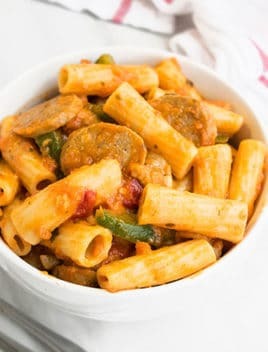 I love one-pot pasta recipes. They are excellent for busy nights! Can this be frozen??? Love to make soups in the fall and freeze it for a quick dinner later. I have noticed pasta doesn’t freeze well BUT you can make the rest of the soup and freeze that. 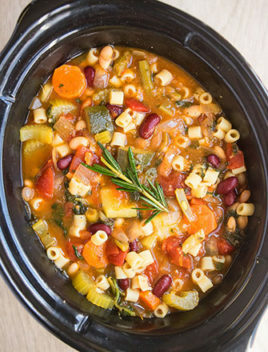 When you are ready for dinner, defrost the soup in a large pot and add the uncooked pasta and cook for a few minutes until it’s cooked. Add a little more broth or water if soup is too thick. i added a lot more noodles and had no milk but used cream cheese to thicken and it was sooo good! Made it with chicken…and sorry to admit I omitted the heavy cream, but used 1/3c cream cheese and some of the seasonings we didn’t have on hand so they weren’t included but this came out tasting so good! Thank you! My daughters friend made this and brought it to our bunco group with a green salad and garlic rolls. So good! I needed some comfort food and this sounded perfect. I am lazy and didn’t measure anything. I dumped in some pre chopped onion (not the whole container) a table spoon or two (again I didn’t measure) of pre-mixed Italian herb blend instead of the individual spices listed and on top of the Italian dressing spice packet I mixed with the beef. I also used beef broth (because I didn’t have chicken) and on top of all that I forgot to add the crushed tomatoes. Even though I totally messed up the recipe it still came out amazing. If it’s this good when you screw it up, I bet it will be out of this world when made correctly. I can’t wait to try making it again and sticking to the directions. Also, quick question for the blogger, how long will it last in the fridge? hahaha! Nothing wrong with experimenting in the kitchen. It should last 2 days in the fridge but if you have already added the lasagna noodles, they will absorb a lot of the liquid and some people don’t like that. That’s why I like to eat it the same day.